We’ve been trying to eat more locally grown food and support our local economy. I was looking at a recent chart of what vegetables are currently in season in Tennessee and saw that sweet potatoes are one of the few. We love sweet potatoes so it is easy to add more into our diet. Most of us, at least in the South, grew up seeing candied sweet potatoes with a marshmallow topping in every meat & three restaurant and on every family holiday table. Thankfully my Mom wasn’t a big fan but she did like baked sweet potatoes so we often ate them growing up. 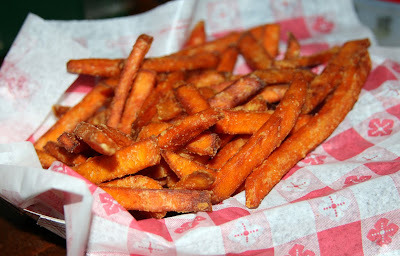 It wasn’t until I was much older, though, that I realized all the fun things one can cook with sweet potatoes! Not only are sweet potatoes delicious, they also have many health benefits. 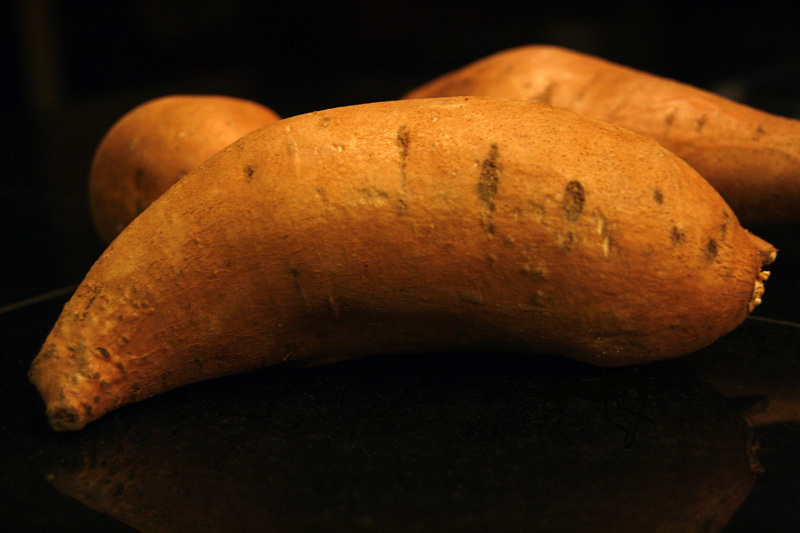 Apparently sweet potatoes are so nutritious that we could actually live on them. Not only do they have huge antioxidant properties, they also are easily digestible and can be good for treating ulcers, inflamed colons, and poor blood circulation. They are also detoxifying since they contain substances called phytochelatins that are able to bind heavy metals like cadmium, copper, mercury, and lead. 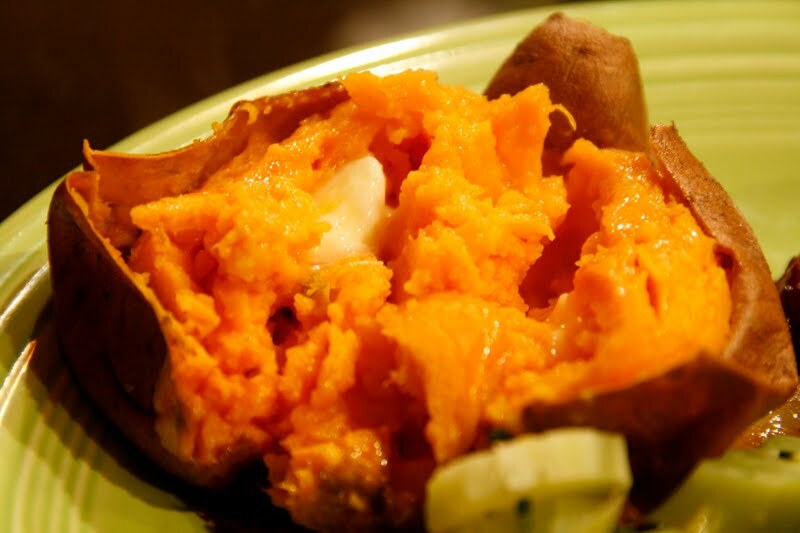 A simple baked sweet potato makes a perfect lunch and it is easy to easy to pack. You can bake ahead and then just reheat. I usually add a pat of butter and a little salt and pepper. I like to either add a few sweet potatoes to my mashed potatoes or just boil them all up and mash them together. The sweet potatoes add a hint of sweetness and give regular creamy white potatoes a beautiful orange tint. Or for a totally different taste, use all sweet potatoes and then mash with a little milk, some butter, and your favorite blue cheese! I like to use Rogue River Smoky Blue from Oregon. This dish goes perfectly with Southern BBQ chicken! Sweet potatoes are so yummy roasted, too. I like to mix them with other root veggies such as beets and carrots with a little olive oil, sea salt and freshly ground black pepper. Another favorite way to roast them is with Yukon Gold potatoes and turnips and sprinkled with crushed fennel seeds and orange zest. Sometimes we eat sweet potatoes for breakfast. One favorite (and slightly naughty) way Grant came up with is sauteing cubed sweet potatoes with onion and Mexican chorizo and then adding in eggs to create a scramble or you can keep the sweet potatoes and chorizo separate and have as a side dish to the eggs as we did below. Breakfast served with my favorite Ed Brownlee coffee mug. Preheat oven to 400 degrees. Place 3 Tbsp olive oil in large baking dish. Wash, peel, and slice carrots and sweet potatoes and place in dish. Cut butternut squash in half, lengthwise and scoop out the seeds with a spoon. Place both halves flesh side down in baking dish with carrots and sweet potatoes. Roast veggies for 40-45 minutes. About 20 minutes in, pull dish out and place peeled garlic cloves under the squash, in the hollow part, and place dish back in the oven. Saute the onion in 1 Tbsp olive oil. Add spices and stir. Add roasted veggies in. Stir together. Remove from stove. In a blender, add the mixture and the stock stock, adding one cup at a time until you have enough liquid to successfully puree the veggies. Add pureed veggies back to the pan and place back on the stove on medium heat. Add remaining stock and stir to thoroughly combine flavors and then reduce to simmer. Add coconut milk in. Stir and simmer a few minutes. In a separate small pan on the stove, heat 1 Tbsp cumin seeds until very lightly toasted. Add 2 Tbsp unsalted butter. Watch carefully so seeds do not burn. Add a dash of salt. And, for a meaty soup, I made this one with sausage and chard. The colors were amazing! Saute the onion in olive oil a soup pot for about 7-10 minutes, stirring occasionally. Add celery and saute a couple more minutes. Add garlic and sweet potatoes. Next add the sausage. I removed the casing which gave the sausage more of a ground Italian sausage feel but you can also leave it in the casing and slice the sausage for a different texture. Once the sausage starts to brown and the potatoes soften, add spices and the stock. 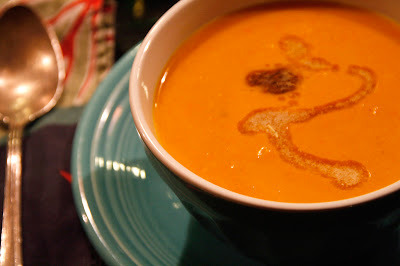 Bring soup to a boil and then simmer for about 30 minutes. Add the chard. Salt and pepper to taste. And… finally, what blog post isn’t complete without a pie?! Preheat oven to 400 degrees. Skin the roasted sweet potatoes and mash them together in a large bowl. Set aside. Mix eggs, sugar, spices, and cream in another bowl. 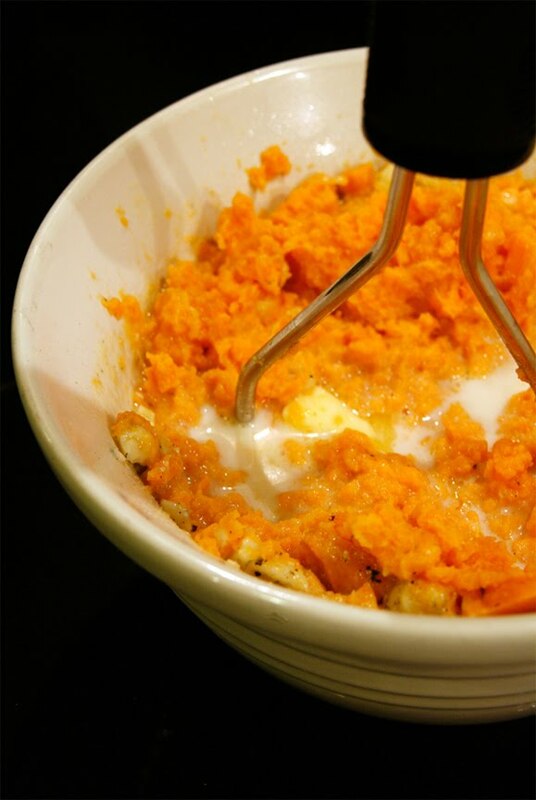 Add to sweet potato mixture and thoroughly mix. Add butter. Pour into the pie crust and bake for 45 minutes or until set. Let cool completely before slicing.